In the dust of this planet the crust of all that is solid is grinded into a penetrable surface. Crust: Sonosesmic Landscape by Saša Spačal and Ida Hiršenfelder is challenging common knowledge about the Earth’s surface. It is a response to the meanings assigned to geographic features that are presented as universal truths learned in schools, essentially subjected to ideologies and geopolitical powers backed up by scientific facts. Not to dismiss any of this facts per se we only propose another vision of the Earth’s layers and insinuate some measure of disobedience. The way we see it – even when speaking about the earth from a human scale – the crust is not to be viewed as a still and unchangeable surface that separates atmosphere and the rock, but rather as a perforated, penetrable and flexible membrane. Learning that seismic noise is mostly generated by wind and ocean waves or even vehicle traffic and industrial activity, we started to explore the tonality in the crust and ended up with ubiquitous humming and cracking sound that allures the ever present listening. We designed a proposition for a new map based on tectonic plates that would enable a flexible vision of the world’s landscape. Our world is turned upside down. The anonymous white surface is attracting sediments of black dust, slowly unveiling the ground beneath. The humming layer of the sound is a recording of seismic noise, while the cracking sound is triggered by the algorithm based on the rhythm promulgated by microseismic movements thus also triggering the movement of a particular plate, depending on the intensity of the microseismic noise. Stylised shapes of five primary tectonic plates are comprised of several secondary tectonic plates that bounce and thrust together when movement is stimulated by the motors. The thrust produces rhythmical sound. The motors are triggered by an algorithm based on micro-seismic field recordings. It may trigger individual or several plates at the same time depending on the intensity of the sound. Each secondary tectonic plate is a sieve made of white gauze strained over aluminum frame. Black dust is placed on the top of the gauze. By inducing movement the dust sieves through the gauze. Tectonic plates are suspended on different levels approx. 80 centimeters apart, just enough for a person to walk between them. 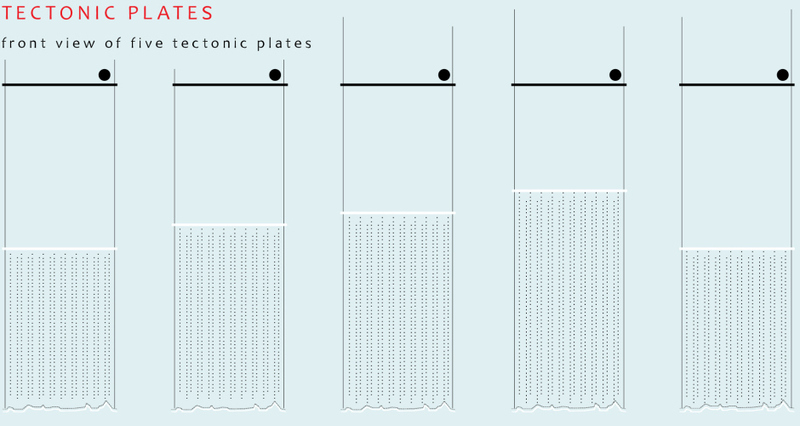 They are suspended slightly higher than the eye level to immerse a person amid the plates. Each tectonic plate has its own corresponding landscape with geographic topology. The black dust is distinctly visible in the mid-air when micro-seismic movement is induced. Secondary tectonic plates are suspended on strings. The motors are attached at the top of the strings and controlled by Arduino, programmed according to data taken from field recordings of microseismic movements. On the floor there is a white landscape with geographic topology. The shape of landscape is parallel and identical to the shape of individual tectonic plate. The dust that sieves through the gauze is falling down on the landscape, changing its geographic topology. The humming layer of the sound is a field recording of seismic noise with geophones. The cracking sound is triggered by the algorithm based on the rhythm promulgated by microseismic movements thus also triggering the movement of a particular plate, depending on the intensity of microseismic noise. The surface is highly affected not only by extraordinary events of intense earthquakes but also by the flexible waves propagating constantly through the planet induced by fierce volcanic explosions and gentle instances of wind, water, human activity and other micro-seismic movements alike. Tectonic plates constantly shake and tremble, but the change shows itself only in a span of geologic time that is infinitesimally longer than any time measurable by human existence. A human, although a significant part of micro-seismic movement, is in no position to trigger or control the behaviour of the planet. Crust: Sonoseismic Landscape creates a moment that confronts the horizon of the planet’s own existence.